Written by Peter Conrad Last time I wrote, I was enjoying my Costa Rica travelat Flamingo Beach in Guanacaste, North Pacific coast. I made a couple tours to the neighbor beaches like Potrero, La Penca and Brasilito. Flamingo is the kind of busy and crowded Beach, like El Coco, with lots of businesses and Costa Rica Hotels. After being in the wonderful rain forest for a few days at Monteverde and La Fortuna, the sunshine of the Beach and the ocean are very welcome by this surfer, and I’m looking forward to having more of this. The next stop of my Costa Rica tour package was Conchal Beach, ten minutes south from Flamingo and less than five minutes away from Brasilito, and next to Punta Conchal, a rocky headline that separates both beaches from Flamingo. You can get to Conchal also from Tamarindo, Liberia and San José, which is a 4 hour drive if you don’t mind the distance. Conchal is an exotic place, with 11 to 12 hours of sun Light during the dry Seaton, between December and April. The water is warm as the rest of the beaches in this coast. The weather is perfect, and it makes snorkeling and swimming two of the most popular activities. Having a great variety of marine life, you Could even see one of the stingrays that swim around the area. Other Sports like scuba diving and deep sea fishing can be practiced at Conchal. 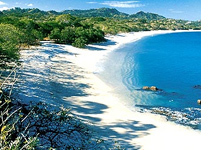 There’s no town next to Conchal Beach, as it happens to be in most of the beaches in Guanacaste. There are a few Costa Rica luxury Hotels where you Could stay, but if you are in a Costa Rica budget vacation, you Could do better staying at Brasilito.